Nintendo loves farts, and they would very much like you to know it. That's right! Farts! 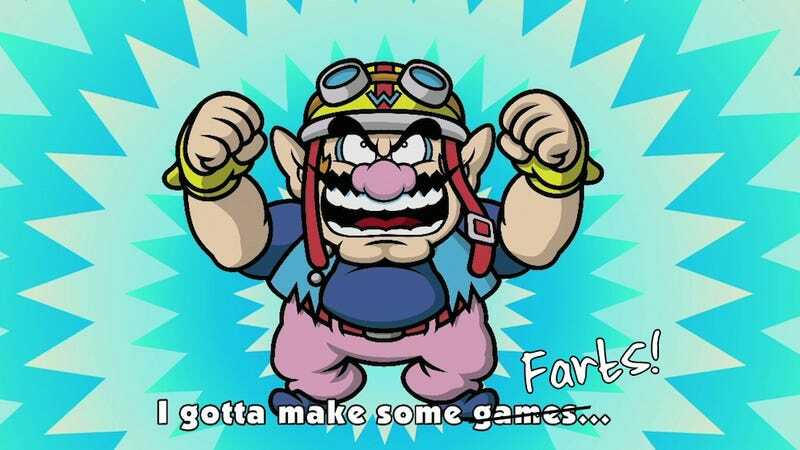 The flatulence in question is tied to the upcoming Game & Wario, a Wii U game that very few people seem to care about. I mean, I'm sure some people care about it, but it's not really garnering the same attention as the new 3DS Zelda or the promise of a 3D Wii U Mario game. Nintendo's solution seems to be: Farts! I was first struck by the farts, so to speak, when I interviewed Nintendo's Bill Trinen at a San Francisco media event back in April. I was asking him about Nintendo's often peculiar sense of humor, and he expertly brought the conversation back around to Game & Wario, observing that the people make that game have their own comedic sensibility. "And then you have a game like Game & Wario," he said. "The Wario team, they have their own very, very distinct, off-kilter humor. Which I love, because any time I can talk about farting in an official capacity, it's fantastic. You'll see a lot of that when that game comes out for Wii U." Well played, Trinen! A little later I asked him about what it would take for the Wii U to reach the same level of success the 3DS has finally found. "I think we're on the way [there], certainly," he said, "we've got games like Game & Wario. And I mean, who doesn't want a game that's gonna openly talk about farts?" Who indeed? Trinen then, of course, went on to talk about other games coming to the Wii U, but all the same, I couldn't help but notice that he had mentioned farts not once, but twice. As if to drive home the idea that Game & Wario is for people who like farts, Nintendo then launched a promotional "Crowdfarter" campaign, which I observed at the time suffered from a distinct lack of actual farts. Only one or two buttons on the page would lead to any fartiness, and even then it was just Wario making a farting sound with his mouth… not enough to qualify as a "crowfarter," in my opinion. Yes, in a new update to the Crowdfarter website, there is now a big green button that makes a farting sound every time you mouse over it. Okay, on the one hand: Heh. On the other hand, while I enjoy a good fart joke as much as the next guy, I do have to say that Nintendo's current fart-fixation smells a bit, not of farts but of mild desperation. Someone, please, care about Game & Wario! It has farts!